In case you missed on the TV, here it is on YouTube: Mariah Carey sprays her perfume for Carlos Santana in the latest Macy's commercial: link. See also: Celebrity perfume news round-up 2008, part the first, part the second, part the third. 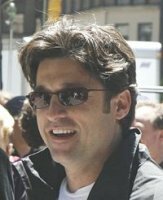 Patrick Dempsey….yummie-licious..oops, sorry, what perfume were you talking about?